Apple has started offering its new slim 21.5-inch and 27-inch iMac with a built-in VESA Mount Adapter as a $40 "upgrade" option for customers who would prefer to mount their iMac on a compatible VESA wall or desk mount (sold separately of course) which can including various articulating arms that open up a more convenient viewing experience such as height and depth adjustments without taking up valuable desk space. Unfortunately, if you'd like to revert back you won't be able to as Apple does not include the original pedestal stand with a VESA Mount Adapter equipped iMac. Unlike previous iMacs and external Apple displays, you cannot purchase a standard slim iMac and fit a VESA Mount Adapter by yourself. 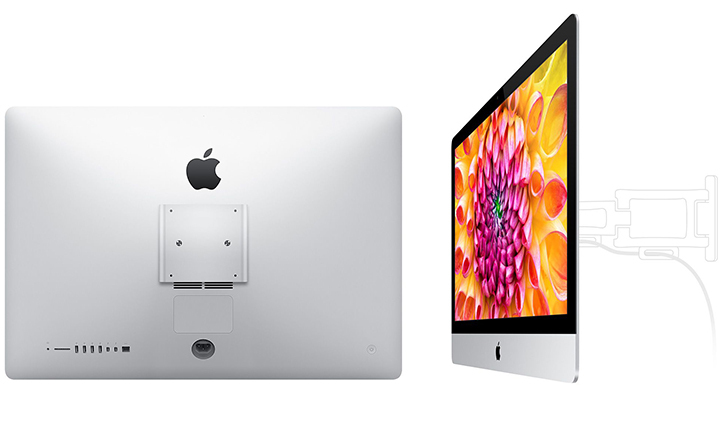 While you're paying a $40 premium over a standard iMac for a simple VESA mount adapter and nothing more, Apple is offering a few different VESA-compatible mounting options that range from $140 to $180. Alternatively you could purchase VESA mounts from places like Amazon which offer a broader variety at less expensive prices.